The Mount Washington Observatory reported a light dusting of snow late Sunday night. The altitude at The Observatory is significantly higher than the altitude of my gardens; I think I have some time to finish cleaning up before the snow flies. I like snow; it covers and protects the gardens like a warm, cozy blanket. I need to put my garlic to bed before nature’s blanket of New England torment is pulled out the attic, but I think I’ve been in denial about the coming winter. I haven’t cleaned up my Hampton Victory Garden spot and I still have a full row of kale in my home garden. I’m in slow motion this fall and I might even be a little discouraged with my seeming lack of progress towards a different life. Manufacturing 500 words or so of blog content has been hard lately, too. 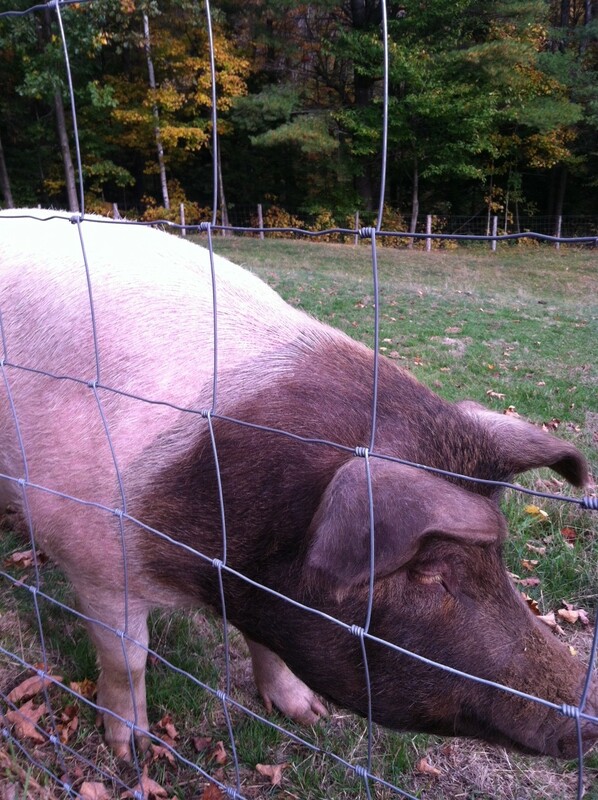 This little pig looks healthy living on pasture. Marc and Meredith Moran keep moving forward with their vision of a different life in the country, in spite of difficult times. They reminded me of the little ways I was making progress, too, even if I couldn’t see it myself. They had a lot of garlic, so I bought two pounds of it and decided to plant three or four rows this year. I’ll have enough to eat and enough to plant. I’ll be garlic-ally self-sufficient! 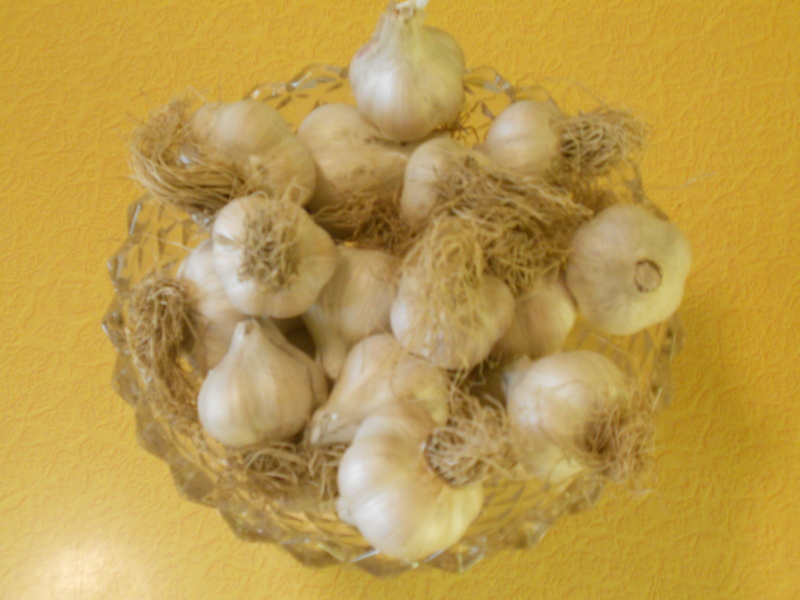 For first time garlic planters, it’s not too late for you to become garlic-ally self-sufficient! Garlic was one of the first things I planted in a serious fashion; seeing it through from planting to harvest (ten months) helped make the fantasy of food production more of a reality. Even if a person had just a small sunny spot, say two feet by two feet, they could plant a few garlic cloves and take a little step towards growing a bit of their own food. I’m thinking of my friend, SK; she tells me she has a grand garden plan in her mind, but she gets discouraged by the work it will take to get from her mind to the dirt. I’m going to save two inspirational bulbs of my garlic for SK. Another inspirational farmer, Herrick Kimball, wrote a detailed treatise on planting garlic. My planting won’t be quite so elaborate this year, but maybe someday. Be inspired by garlic today! This entry was posted in Cooking and Food, Farmers and tagged garlic, Herrick Kimball, Hopewell Farms, Inspiration, Mount Washington Observatory. Bookmark the permalink. I am so inspired and can’t wait to receive the bulbs for planting!!! I am going to pursue my original spot and worry about the water situation later. If I could get it to stop raining (torrentially) on the weekends then I could get those two little kids to work with me at clearing the area. And then maybe I could get that rain barrell set up so I can collect all that snow that’s going to come this year! Moving forward with the grand plan! But still thinking small as far as what plants to begin with! Steady on! One thing at a time. Maybe I will see you on Friday; if not, we will make other arrangements!